Article contributed by J. Darland. 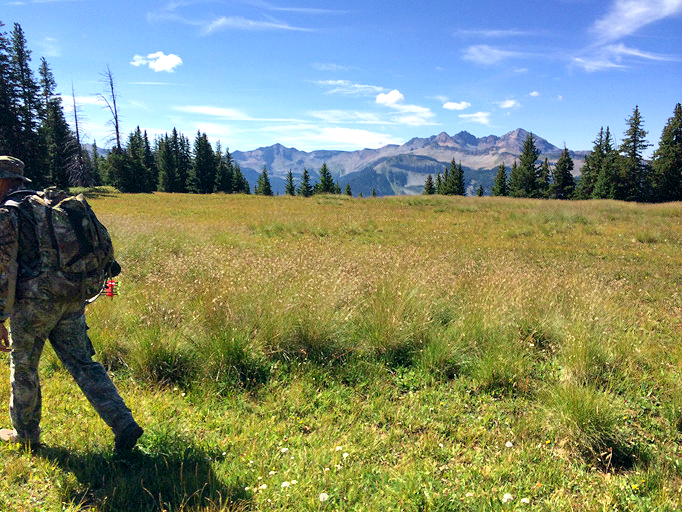 This is the second part to his father’s elk hunting adventure. Read Part 1 here. It’s a Tuesday afternoon and my dad is waiting for the arrival of his buddy, Kelly, who is coming in from Oklahoma. As he waits, he patiently inspects all of his gear to verify that is where it should be. Once Kelly arrives the they take off for the woods to hunt Elk. They plan on being out there for up to a week or as long as it may take to harvest an Elk with their bows. As they drive, they discuss their plans for the upcoming week. The plan is to camp within a couple of miles from the meadows that my dad and I had previously found. These meadows were the ones we had come across on our last day of the hunt a few weeks prior. After settling into camp that night they looked over maps just so Kelly had an idea as to where they would be hunting the following morning. That day began early and included two bulls that were very vocal, to say the least. Dad and Kelly had sightings of these bulls a couple of times that day. They called in one of the bulls close. It was close enough for what some people might consider a comfortable shooting range at 79 yards. 79 yards was 9 yards further than what Dad was comfortable shooting with a bow. He did not want to take the chance of missing and injuring the animal without striking a vital blow. Some people might have just tried anyway and taken a careless shot. That’s not how he’s ever operated. It’s always been about the clean kill. That bull never took a step closer than 79 yards. The only benefit they received out of that encounter was knowing that the bulls were very active and that they were responsive to the calls being let out. The following morning was the same as the previous morning. They called back and forth with the bulls in the area. They heard these bulls but never drew them close enough to see them. The whole day was filled with positive responses to the calls but just not with many actual sightings. Later in the afternoon, Dad and Kelly were taking a break. They were leaned up against a log which made for a good back rest. Keep in mind that Kelly is 79 years old and has come from sea level to a higher elevation. At this point, the elevation difference and the added physical movement from hiking has transformed this day into quite the hunt for him. They sat against the log and chatted. Every now and then they would blow the Elk call. They would not get any responses but still continued to call regardless. Dad was in the process of putting on his jacket when he saw tines sticking up from some nearby brush. 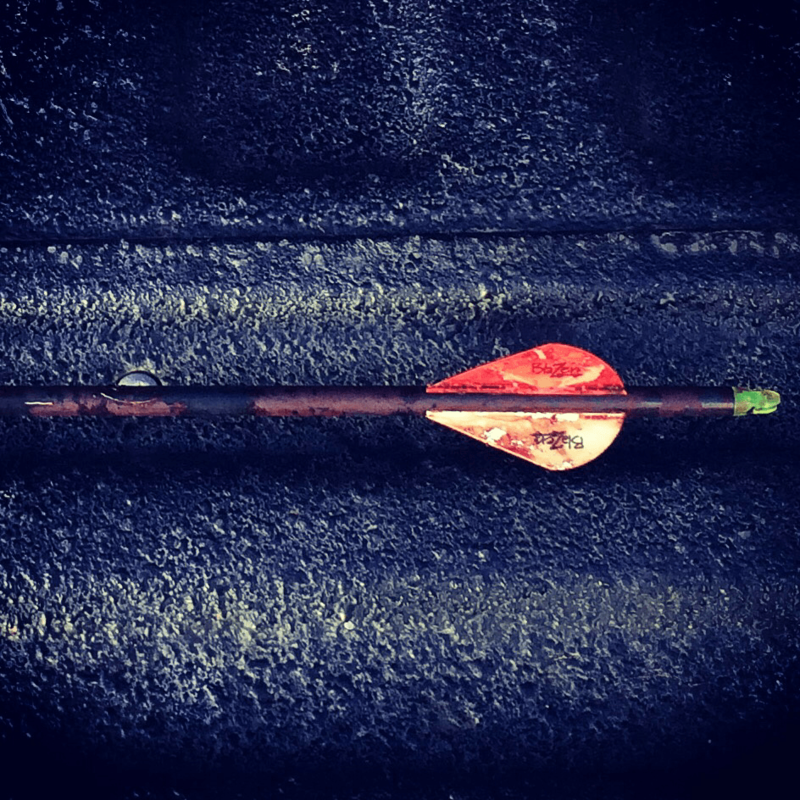 He immediately picked up his bow and notched an arrow on the string. As he readied his bow his eyes were locked on the bull’s location. The bull was moving across the meadow in front of him. As the bull traversed across the meadow the full, massive body of the animal became visible. The rangefinder read 39 yards. From Dad’s position, the bull was to his left and was continuing to traverse across this meadow from left to right. Dad drew his bow back and placed the sight on the elk’s body. He held steady and released the string. BOOM! All that was heard was what sounded like a gun shot. If you recall, Dad had just put on his jacket. He didn’t have time to put on his shooting sleeve. This is a sleeve that compresses clothing as tight as possible and keeps it out of the way so that your bow string doesn’t strike your clothing as you release. His jacket sleeve had caused the loud noise when he fired his arrow. Once the shot was fired, the bull fled to the bottom of a meadow that was adjacent to a creek. They lost sight of the bull and began tracking him from the area of where he was shot. They located a blood trail from they shot and came upon half of the arrow. 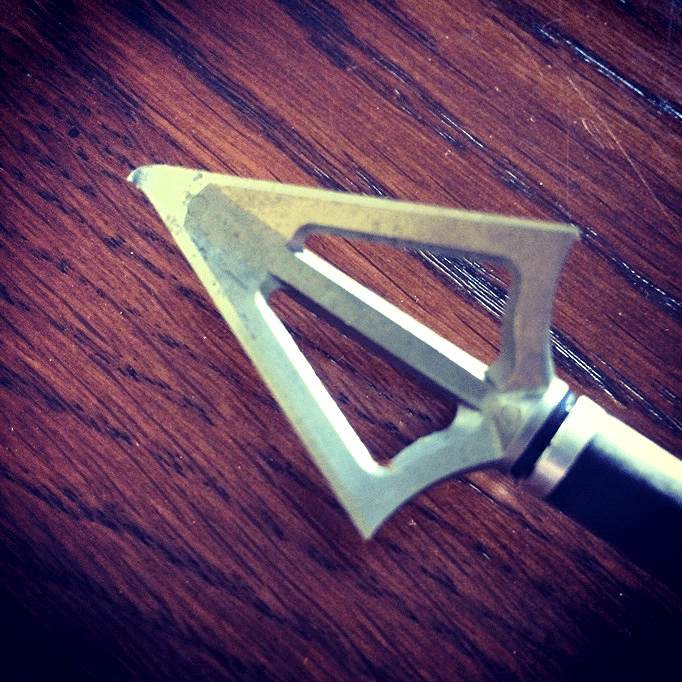 This half of the arrow included the broadhead. Based on the appearance of the arrow and the amount of blood which was present it appeared that the arrow it had definitely gone through the bull. They continued to follow the blood trail. They were also finding bone fragments along this trail of blood. Dad was not only surprised by this but curious as to why there was so many fragments in the blood. They soon sighted the bull but he was not down. Dad and Kelly cautiously split up to see who could get the better shot. They were careful not to get too close to the bull as he might charge. Dad stuck the bull with another arrow and within a few moments the bull was down. The final resting spot for this bull was right in the middle of the creek. They approached closer to the bull Elk and Dad realized that this bull was shot a little back of the vitals. They examined the wound and determined that the arrow traveled and shattered the elk’s right leg on its way out. That explained the bone fragments that they had come across along as they were following the blood trail. Dad was at a loss for words at finally seeing his bull down on the ground. 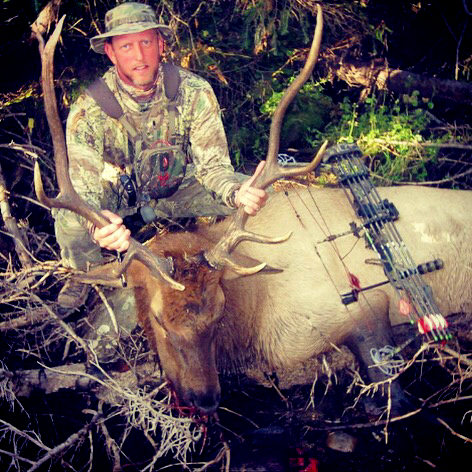 He had finally harvested his first elk and it was done so with a bow. Dad posed with his bull for a couple of photos to document the experience then the work would begin again. They started the quartering process. The meat would have to be cut off the animal to be packed out of the woods. Dad said that this Elk was his most challenging experience he had ever had in regards to quartering an animal in the field. The water level in the creek at the time made for a chilly experience as they had to stand in it to process the Elk. He later went on to say that cutting the backstrap off of the bull made it all worth it in the end. The backstrap is the best quality meat on the entire animal and is highly valued amongst hunters. Time went by quickly as they quartered the bull and removed the backstrap. It was late in the evening and darkness was quickly coming. Dad packed up the backstrap and the head mount of this beautiful animal into his backpack and they then headed back to camp. They had bagged the quarters of the elk and would be back the following morning to pack those out. Dad shot me a text message from his GPS once they got back to camp. As I previously stated, the definition of a trophy kill varies between hunters. Yes, the most popular definition of a trophy kill is an animal that is a larger than life and is mounted on the wall due to its insane mass and features. This Elk is, by no means, a state record but it is no scrub either. In a lot of situations it is not always about the kill but in this case it was. For my Dad, that Elk is his trophy and a symbol of achievement which adds a lot of value on top of the reward of the meat it provided. Find your wilderness and harvest it! Excellent job! I had a hunt planned north of Durango but had to cancel. I’m jealous!